When Jeep revived the Cherokee name back in 2014, it did so on a midsize crossover with styling unlike any Jeep before it, with a controversial front end complete with insectoid turn signals. 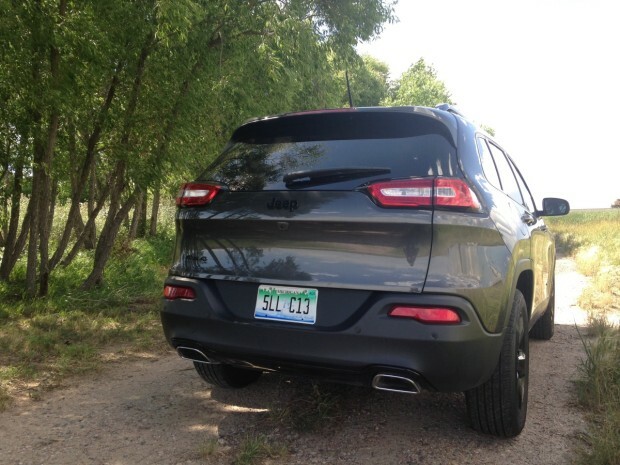 In person, the 2015 Jeep Cherokee Latitude tested here looks a lot better than in pictures. Most of the credit needs to go to the paint and trim colors. The Granite Crystal Metallic paint – metallic dark gray without the corporate name – is matched with an appearance package that blacks out all the trim. The alloy wheels are even painted black. The color scheme gives this Cherokee a downright menacing look. The look is further enhanced with the black cladding on the lower portion of the body, a trick many manufacturers use to give car-based crossovers the appearance of having more ground clearance. The Cherokee also looks more substantial than in pictures, with a long hood and chunky proportions. It’s a smart looking vehicle, even though the rest of the body isn’t nearly as distinctive as the front end. Inside, the Cherokee has good front seat room and decent rear seat room, although tall occupants will run out of legroom before they run out of headroom if the front seat passenger is also on the tall side. The dash is attractive and functional, with a large 8.4-inch touch screen and real knobs and buttons for the climate control system. The steering wheel is wrapped in soft leather and the dash and door panels are clad in what looks like leather but is most likely vinyl. Most surfaces that are touched most often are soft, but some hard plastic remains, especially on the lower portion of the dash and console and on the B-pillars. The seats are made of a high-quality nylon material that’s grippy and gives the appearance of durability. Seat comfort is excellent, especially the 8-way adjustable driver’s seat. The seats don’t quite have enough side bolstering for spirited driving, but the Cherokee doesn’t pretend to be a sports car, so the extra bolstering isn’t really needed. The Cherokee’s cabin is overall a nice place to spend some time. Under the hood of this 2015 Cherokee is the optional 3.2-liter V-6 engine that puts out 271 horsepower and 239 lb-ft of torque. It’s matched with a 9-speed automatic transmission through Jeep’s non-trail-rated all-wheel-drive system. 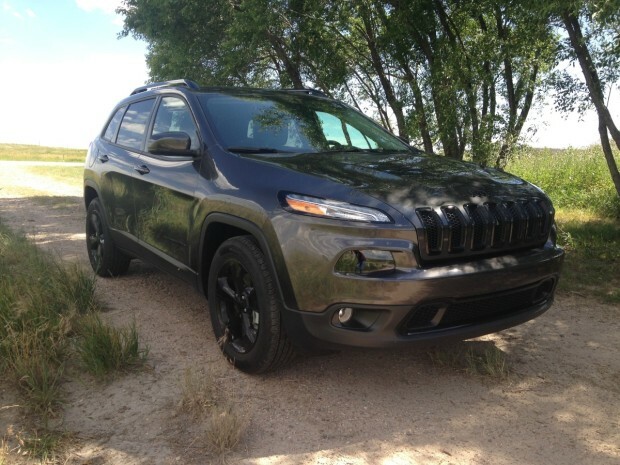 The engine has good power, but the transmission is slow to kick down even from a standing start, giving the Cherokee the feeling of being slower than it is. With the V-6 and 9-speed auto, the Cherokee is rated at 20 mpg city, 28 mpg highway and 23 combined. The MSRP as tested is $33,825, with a base price of $27,095. My lovely girlfriend recently purchased a t-shirt that reads: “Good girls go to Heaven, bad girls go everywhere.” That shopping spree was done while I was entrusted with Chrysler’s 4-door monster. When she picked the shirt out, I couldn’t help but draw a parallel with the Hellcat. “Good” cars like the Toyota Avalon (a competitor to the regular Charger) will go to a nice quiet home and be driven leisurely in the suburbs, while a Charger Hellcat will likely be adopted by a person or persons that are liable to be involved in countless “bad” things and some kind of motorized mayhem on weekends. The Hellcat will surely be driven hard and everywhere, including the track. What more can be said about the Hellcat other than it is an absolutely insane automobile? Well, for starters, I did not track the car. I obviously went shopping with it (groceries, clothing, and otherwise); I essentially used it every day, as I would have a Micra (#becauseracecar). Other than profusely filling the gas tank, I found the car comfortable, roomy, well assembled and equipped. It is also senselessly fast, ridiculously loud, and looks like a werewolf on steroids with rabies. It was hard to hide my stupid grin each time I walked up to the car, red key in pocket. The Charger Hellcat is not a good-looking car. It reminds me of Mark Henry from the WWE: he looks like a killer, scares the makeup off prostitutes, and there’s no way you’d ever dare cross him. The Hellcat is much the same, except for the prostitute part… The massive wheel and tire combo, the menacing mesh grilles, and the bulging hood tell any would-be streetlight competitors that they’re absolutely wasting their time. Time is key where this Charger is concerned, how little of it will be involved to get around that is. Nearly all enthusiasts in the world are aware of these, but here’s a brief breakdown just in case: the 0-100 km/h sprint is completed in under 4 seconds, the quarter mile flies by in an NHRA-certified 11.0 seconds on street tires, and (for fun ) the race-against-the-clock 0-160-0 km/h event takes place in under 13 seconds. Top speed? Yes. How about 204 mph or 328 km/h? Numbers are a huge part of what made this car set the interwebs on fire late last year when it was announced. Subsequently, videos of the car shredding rubber at every occasion further added fuel to said fires on the net. Now, I’ve driven many fast and powerful cars over the years (SLS AMG, 911 Turbo S, Gallardo, GT-R, and more) but only one or two felt nearly as vicious as the Hellcat. To put it concretely, every gap between cars on the road becomes an opportunity for forward progress. You see, from a standstill, the car’s electronics, transmission, asymmetric limited-slip differential and gigantor tires have an immensely difficult job harnessing the supercharged 6.2L HEMI V8’s Jupiter-size power. Although acceleration is mind crushing, the real pleasure comes from passing manoeuvres. Picture a Douglas DC3 flying at its cruising speed (207 mph or 333 km/hr) being passed by a Lockheed Blackbird going roughly 15 times faster… This gives you an idea how quickly surrounding traffic becomes a thing of the past when the throttle is mashed. The most important stats, the Hellcat’s calling cards, are its output and they are nothing short of lottery-winning exciting: 707 horsepower and 650 lb-ft of torque. But before we get to what it feels like to crush every other car on the road with this kind of power, consider what it’s like when the SRT’s heart bursts to life. This video was done when the engine was warm. On a cool morning, residents in the next area code followed the furious rumble to see what the hell was going on. Superchargers have, until recently, had a definite advantage over turbochargers and that is constant and instant boost. Although most current turbos are used on engines with direct injection and higher compression ratios, a blower still has the advantage at low rpm. Much like a normally aspirated mill, power build-up is linear, only in this instance the rush is space-shuttle like. And it’s supremely addictive; heroin ain’t got nothing on this. The rush is a rush, the adrenaline pumps, palms get sweaty, grip tightens, and the V8 has only just turned over. It’s an event. The drama doesn’t just take place with the right-hand pedal. The Hellcat’s gargantuan Brembo brakes erase forward momentum faster than a teacher a student’s obscenity on a blackboard. The front 6-piston and rear 4-piston callipers chomp down on some of the largest standard fitted discs this side of $100k. Their power is supreme. Thank you FCA for this wise addition. Taking to the road is surprisingly fun. And by fun I mean not frighteningly uncomfortable for a family sedan that boasts more power than a Lamborghini Huracan. 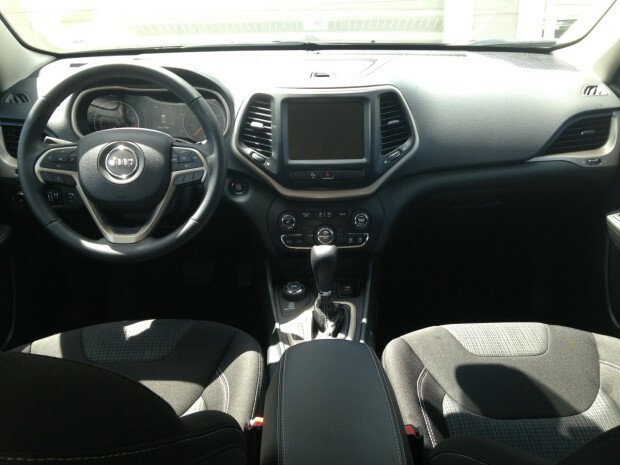 The ride, like many other driving functions, is adjustable through three SRT-unique selectable modes: Street, Sport, and Track. In Street mode, the Charger is, well, a Charger. Sport gets interesting, but damping pliability is too limited for Montreal roads, and Track is perfect for that. Putting all that power to the drive wheels requires one hell of a transmission and FCA’s 8HP90 Torqueflite 8-speed automatic is tremendous. This box’s efficiency is such that it makes me wonder why some manufacturers have a hard time properly engineering and programing a transmission for a small displacement 4-cylinder car. All eight gears are perfectly judged and their programmed call to action is exceptional. The transmission will quick-shift, rev-match or cruise smoothly. Its eagerness to drop three of four cogs in a passing maneuver catapults the car forward with the vigor provided by the boosted V8. The transmission can be controlled via the wheel-mounted paddle shifters; however, I don’t like them. I made note of my thoughts in my Grand Cherokee SRT review. If the hype and anticipation are huge on the outside, the cabin excited with its sport seats, but that’s about it. The suede-leather perches are huge, but sufficiently snug for the average male adult. The optional red seatbelts are a great touch. As always, FCA’s Uconnect infotainment system is pure gold and one of the best in the business. Five adults fit with ease, but you already knew that. What you want to know is that a base Dodge Charger Hellcat sports a near $70,000 price tag. With the few available options, the price can climb to just over $76k. Your options in this horsepower range? Nil. In this price range? Nil. The Hellcat is a rare and fantastic beast of an affordable supercar that is unlike any other. The Dodge Durango shares a platform and powertrain choices with the smaller Jeep Grand Cherokee. The two vehicles are even built in the same factory. With all seats in place, the Durango offers 17.2 cu. ft. of cargo room. Fold the rear seats down, however, and you have 47 cu. ft. of space. Despite riding on 20-inch alloy wheels, the ride was composed and the Durango remained very quiet on the highway. Unlike many three-row SUVs, the rearmost seats in the Durango can actually be used by adults (for short distances). The optional Blacktop Package includes a blacked out grille, wheels, and exterior badges. I may have unintentionally discovered one of the world’s best fly-fishing rigs and it’s called the Ram ProMaster City. That claim may throw you since this van is specifically designed for city work. But after a road trip to Idaho to fish the Snake River, I can confidently say it’s nearly perfect as a long-haul conveyance to get people out of the city and to the banks of a river. Whether you fish or float or camp is entirely up to you. Let’s dive in to five reasons to drive the 2015 ProMaster City, a van that is new to America for 2015. There is more than one Ram ProMaster in the fleet. We reviewed the big one, the Ram ProMaster, back in 2014 and identified many reasons why this huge machine is a smart choice for tradespeople. This week’s tester is the smaller, yet still spacious, Ram ProMaster City that is designed for work in urban confines where a tidier footprint is a premium feature. You can buy the ProMaster City Cargo Van with seating for two and loads of space in the rear cargo area or the ProMaster City Wagon with seating for five and a generous amount of cargo space. My test model was the five-passenger ProMaster City Wagon. Choose the two-seat cargo van and you gain 131 cubic feet of cargo space Ram proudly boasts as “best-in-class.” You also gain a best-in-class payload of 1,883 pounds. Since the ProMaster City feels as tall as it is wide, you can stuff all kinds of stuff inside. For our Snake River fishing trip, we loaded bags and duffels and waders and fly rods and food and coolers and sleeping bags and more — and still had tons of space. You can load the same stuff in the bed of a typical full-size truck, but the ProMaster also includes tie-downs and other storage features that make securing your stuff easy and secure. The other impressive storage feature is the step-in height of only 21.5 inches at the rear and 18.8 inches on the side that makes it easy to load the van or step in and out without feeling like a mix of climbing and leaping skills are required. The ProMaster City comes standard with a 2.4-liter four-cylinder engine that makes 178 horsepower and 174 pound-feet of torque and is mated to a nine-speed automatic transmission. Those extra gears improve fuel economy and the ProMaster City averages 21 mpg in the city and 29 mpg on the highway. I covered more than 600 miles and averaged 25 mpg. With a 16-gallon fuel tank, Ram claims the ProMaster City delivers a best-in-class highway driving range of up to 464 miles. By comparison, the larger ProMaster van comes standard with 3.6-liter V-6 that generates 280 horsepower and 260 pound-feet of torque and is mated to a six-speed automatic transmission. If you need more power, more space and more capability, the large ProMaster is the way to go. Yet most drivers will strongly prefer the smaller size and fuel economy of the ProMaster City. Another important consideration is that the ProMaster City can tow up to 2,000 pounds when properly equipped. We attached our drift boat to the Class III receiver hitch and the van easily pulled this lightweight boat up and down mountain roads on our way to the Snake River. I’ve driven plenty of trucks over the years and the ProMaster City is as easy to drive and maneuver as a small truck like a Toyota Tacoma or Nissan Frontier. And it’s easier to maneuver than a Ram 1500. Throw a trailer on the back and you’ll be surprised at how quickly you can angle it into tight places on the first try. The available rearview camera helps a great deal whether you have a trailer or not and is highly recommended. Visibility is excellent out the front window and decent to the sides. The large side mirrors improve visibility and eliminate blind spots. In terms of driving dynamics, the ProMaster City feels more like a minivan than a truck, though you’ll notice the body roll its tall height creates if and when you make quick highway moves. It was comfortable enough for a four-hour drive but it’s not luxurious and the seats have limited adjustments to increase your comfort. None of my passengers complained, though legroom in the rear seats is less than you will enjoy in a true minivan or truck. Similar to the larger ProMaster van, the City Wagon features front-wheel drive that improves traction on a snowy day. There are four ProMaster City trims that start just over $23,000 for the ProMaster City Tradesman Cargo Van and top $25,644 for the premium ProMaster City SLT Wagon. My ProMaster City Wagon test model started at $24,130 and included cloth seating for five, a tilting and telescoping steering wheel, remote keyless entry and manual rear and sliding doors. Recommended upgrades like a rearview camera and rear parking assist system, the Uconnect infotainment system with navigation, Bluetooth, side roof rails and the Class III trailer hitch improved the overall package. All in, this well-equipped van, er, wagon, cost $27,945, including a $995 destination fee. I’m a fan of the Uconnect infotainment system because it’s easy to program and easy to use. You can quickly pair your smartphone to enjoy the safety and convenience of hands-free phone calls and streaming audio. Satellite radio is available, though many drivers will be content to stream their own playlists from their phones. The Uconnect 5.0 system features a five-inch color screen and is a recommended upgrade. Another intuitive feature that deserves mention is the way Ram fits audio controls that sit on the back of the steering wheel and allow you to adjust volume and tune the radio or toggle between media types with your fingertips. That improves safety because it means you don’t need to take your eyes away from the road to make audio adjustments. 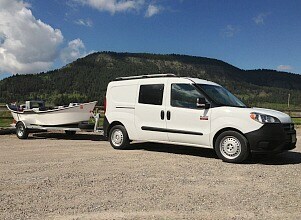 The ProMaster City was easy to drive in the city and exceptional for my fly-fishing road trip. Four-wheel or all-wheel drive is not available on the ProMaster, which is a shame because it might transform this city van into a machine that is perfect for outdoor enthusiasts who wish to carry bikes, inflatable rafts, fishing gear and more. That one nitpick aside, the ProMaster city leaves a favorable impression and I expect to see a lot more on the roads in the coming months as more commercial drivers discover its domestic charms. 2015 Ram ProMaster City Wagon photo copyright Speedy Daddy Media, Inc. Sometimes friends and family can be annoying and your opinion of them momentarily changes. But if you like a person enough, those little annoyances fade and don’t permanently affect your feelings. Likewise, my relationship with our long-term Jeep Cherokee Trailhawk has at times been tainted by small annoyances, but in the end it always swings back to the fact that I really like it. I wasn’t the original chaperone of our long-term Cherokee, but when Rory Jurnecka left our shores for AUTOMOBILE, I jumped at the chance to take over the responsibility of this little off-roader. I enjoy camping, hiking, and kayaking, and the Cherokee is the perfect size to fit everything my wife and I need for an active weekend while leaving ample room for our spoiled dog to take up the entire rear seat. At a total price of $37,265, our Deep Cherry Red Crystal Pearl — that’s a mouthful — Cherokee Trailhawk came pretty loaded, including the optional 3.2-liter V-6, which came in handy, especially while towing, but we will get to that later. We also opted for the upgraded stereo with nine amplified speakers and a subwoofer, the Technology group, which includes a host of safety features, and the Comfort/Convenience group of optional equipment. With the Technology group, the Cherokee was outfitted with all sorts of cool and helpful vehicle aids. Some of the more notable features included parking assist, which steers the car into a parallel or perpendicular spot as you control the brake, adaptive cruise control, and LaneSense, Jeep’s lane departure warning, which provides haptic feedback through the steering wheel and auditory warnings if you began to drift in your lane. Our tester also came with a forward collision warning system that engages the brakes if a collision is imminent. This particular feature came in handy on my drive home one evening when the traffic came to a standstill right as I was checking my blind spot to change lanes. Unfortunately, the system would also kick in every morning as I backed into our office’s parking spot and the car thought it necessary to save me from the concrete pillar that I always park next to. You would think that after most of a year, I would remember to turn the feature off before starting to park. You would be wrong. In one of his first updates, Rory wrote about off-road-capable SUVs being an underused segment, and although I didn’t spend every weekend on the trail, I did manage to take the Jeep off-road on a number occasions. Like Rory, I was impressed by how easily the little four-wheeler handled rough terrain and steep inclines. It seemed like everyone else on the trail was confused about why or how we were able to be off-roading in the Cherokee. “Are you OK? We don’t normally see cars like that out here,” exclaimed one friendly passerby on a dirt bike. Thank you for the concern, but the Trailhawk is doing just fine. The off-road capability was also the reason the Cherokee felt a little special. The knobby tires, the exposed red tow hooks, and slightly higher ride height made me feel like I was driving something a little more capable than the guy next to me in the Honda CR-V, and I was. One of the first things I did when I took over long-term duties on the Trailhawk was to take it on a long road trip through Arizona, Colorado, and Utah. It was on this trip that I realized how comfortable our Cherokee really is. A combination of good ride quality, supportive seats, a good stereo, and adaptive cruise control made the Trailhawk an excellent long-haul road tripper. The one demerit I would give the Jeep is for the 15.9-gallon fuel tank, which doesn’t get you very far before you start looking for another Chevron. Even without a trailer in tow (a really cool off-road teardrop from Off The Grid Rentals), a 300-mile tank was rare. When put through our Real MPG testing, the Jeep managed to get 19.2 miles per gallon combined, which puts it squarely in the neighborhood of a Toyota 4Runner (15.1/20.9 RMPG) or a Nissan Frontier Pro-4X (13.9/19.3 RMPG). I realize these two might not be obvious competitors, but name another V-6-powered small SUV that is as off-road-focused as the Trailhawk. Until Toyota makes a V-6 RAV4 TRD Pro, the Jeep is sort of on its own. Now onto those small annoyances I alluded to. Along with the standard service items such as oil changes and tire rotations, the Jeep had its fair share of visits to the dealer. The original issue was a recall of the adaptive cruise control module, followed up by three transmission reflashes, including one because the ECU had lost communication with the gearbox while photographer Julia LaPalme was driving back from a photo shoot. We also had a hidden inline fuse in the dealer-installed tow electronics burn out during our Colorado road trip, but I blame that more on the mechanic who installed it and the one who misdiagnosed it. Take my word for it: Get the tow package from the factory. When it’s installed at the factory, you get an upgraded alternator, integrated electronics, an auxiliary transmission cooler, and a Class III receiver hitch with seven- and four-pin hookups. Oh, and the door handle fell off during a ski trip, and I had to argue with the dealer to get them to fix it under warranty. In all, we spent $159 for two oil changes, inspections, tire rotations, and one cabin-air filter. The per-visit cost ended up being about the same as our 2013 Honda CR-V ($220.66 for three stops) and less expensive than our Mazda CX-5 ($456.21 for four) and Nissan Rogue ($648.61 for four). The ZF-developed nine-speed transmission has been the Cherokee’s main topic of concern. Early in the loan, Rory wrote about the transmission hunting for the correct gear especially when cruise control was set. With each update the shifts did seem to become smarter and smoother, although it was never perfect. The occasional clunk from a confused gear shift or incorrect ratio while maintaining speed up a hill was just part of the driving experience. The Cherokee is not the only ZF nine-speed-equipped car that’s had issues. The Land Rover Range Rover Evoque also struggles with the unit. Associate online editor Kelly Plescot wrote of the Evoque, “The nine-speed feels laggy at low speeds, and our tests discovered it was particularly slow between 5 to 10 mph compared to the old model. And once you’re on the move, you can definitely feel the transmission jolt a bit too eagerly between gears.” Jeep continues to update its software, each time getting a little better. Honestly though, I got used to the nine-speed after awhile. So here’s where that leaves us: The Jeep Cherokee Trailhawk is a comfortable small SUV with more off-road prowess than its direct competitors. The $37,265 price tag is hefty, and that gets you a decently optioned Toyota 4Runner if your main concern is going off-road. What you won’t get from the Toyota is the ride quality, the comfort, or the technology goodies the Trailhawk provides. Was the Jeep without faults? No, but those faults were mostly little annoyances that faded over time, certainly not enough to permanently poison my opinion of this little off-roader.